Celebrating the second anniversary of Shruti’s Blog! With tales, reminiscences near and dear. What will she write next? What will she post? Spare us the torture may think some, not most! Why must I write? Why not only cook and click? The legacy I bequeath but a debt I am repaying. How many more to go? Where will it all end? Till then, let me in my wanton pleasures splurge. In a non-stick pan, heat oil and add onions and sauté. After half a minute, add the garlic and ginger pastes and cook a little. Then add all the finely chopped vegetables. Cook for a few minutes on high heat, working the mixture all the time to keep it dry. Add all the spices, soy sauce, vinegar and salt. Adjust the taste. Cool the filling. There are several ways of folding the wontons, depending on the shape of your wonton wrappers. I used gowjee wrappers, which are round. Brush the edges of a wrapper and place a spoonful of the filling in the centre. Bring the sides together in the centre holding them to make a half circle and pinch little pleats on one side. Crimp both sides firmly together. Repeat with remaining wonton wrappers and vegetable mixture. Cover with a damp cloth. Place a lined steamer atop a saucepan half filled with water. Bring water to a boil. Place the wontons in the steamer and steam for about 10 minutes. Meanwhile, heat a medium sized pan and add oil. Then add the onion, garlic and ginger. Sauté for a minute and then pour the vegetable broth and some water and bring it to a quick boil. Add a little salt (check the salt levels if using readymade stock) and a dash of pepper to season. Add the soy sauce and vinegar to balance all flavours. 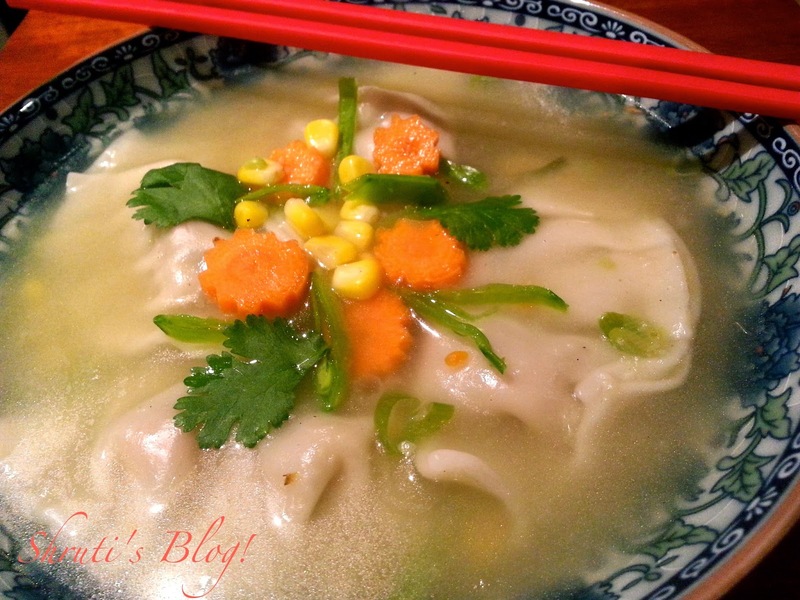 Place the hot steamed wontons in individual soup bowls. 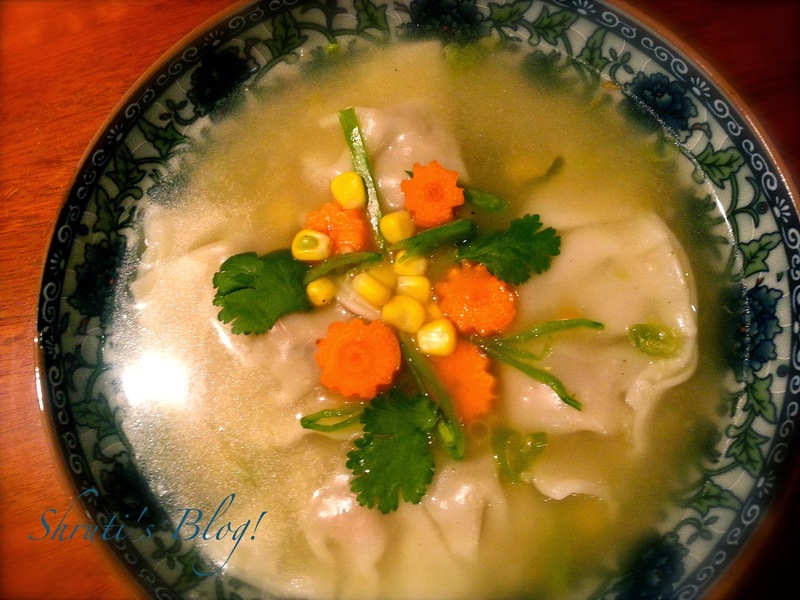 Pour the boiling hot broth into soup bowls over the wontons. Garnish with sliced green onion, sliced carrots, snow peas and corn kernel/baby corn and coriander leaves. Serve immediately, with a soupspoon and a pair of chopsticks, if you insist. Never prepared at home But like it very much .Must try now.Can wanton raps be prepared at home?I think those r made from maida and corn flour.